Opinion Forum » The Issue Won’t Go Away: Where Was Obama Born? The Issue Won’t Go Away: Where Was Obama Born? The issue of where President Obama was born just won’t go away. I wrote an article 18 months ago that posed the question: “The President could put this whole thing to rest simply by releasing his detailed birth certificate. Why won’t he do that?” I believed at the time, as the evidence indicates, that he was born in Hawaii, and I still believe it. I also still wonder why the President won’t put an end to the debate. Now some Democrats are asking the same question. 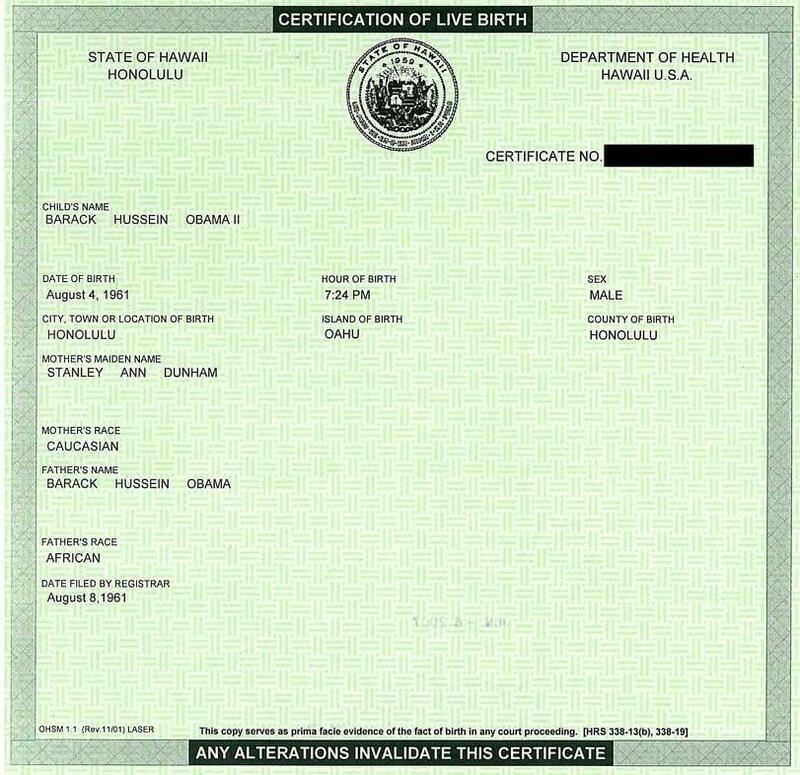 The new Democratic governor of Hawaii, Neil Abercrombie, said he’s “going to take care of that.” It isn’t clear what he plans to do, but he’s apparently working on determining whether there is some way for him to release all or part of the information on Obama’s long-form birth certificate. One thing is certain, though; if President Obama doesn’t want that information released, Governor Abercrombie may find that the President has a very long arm. 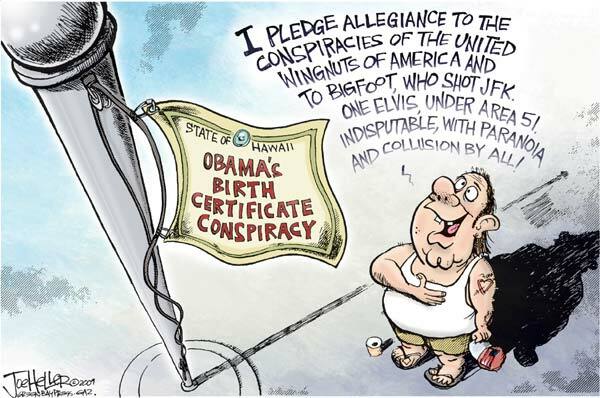 Meanwhile, the “birther” conspiracy theorists are tenacious, doggedly seeking a copy of “the original document,” the long-form birth certificate on which Hawaii’s Certificate of Live Birth is based. They generate repeated requests for the document to the State of Hawaii, to the point that two state government staff members spend an hour a day responding to requests for the birth records. Governor Abercrombie says he knew Obama’s parents during the period in which he was born. He saw them at social functions, together with the baby. He may not have been present in the delivery room, but that’s pretty good evidence. Birth announcements were routinely published in two local newspapers. Beyond that, no credible evidence has emerged to prove that Obama was born elsewhere. The name of the father is blank, despite what the Certificate of Live Birth shows. The father’s name is not Barack Hussein Obama, despite what the Certificate of Live Birth shows. The father’s name is Barack Hussein Obama, but there’s an indication that his parents weren’t married. The records contain information that would call into question the President’s citizenship. The records contain facts that would reflect adversely on one or both of the parents. The records indicate birth anomalies of some kind. That kind of speculation is irresponsible because we don’t know what the facts are, and that’s my point — simply releasing the records will put the whole thing to rest. Or maybe not. There are other official documents, quite a few in fact, that Obama hasn’t released. If the birth records raise other questions, then there could be significant pressure to release other documents, some of which the President might not want to release. There’s another possibility that’s Machiavellian in the extreme. Once the “birther” conspiracy theory became prominent, perhaps Obama and his political strategists decided to just let it build. Then at an opportune moment they could release the birth records and completely discredit the birthers and Republicans who supported them to any extent. Strange, yes, but this is politics. I think we’ve gone too far in demanding that politicians reveal every detail of their personal lives. However, modern political reality makes it impossible for high-level politicians, especially the President, to expect the same kind of privacy that normal citizens enjoy. We’ve come a long way from the days when the press was willing to ignore President Kennedy’s sexual romps in the White House out of respect for his personal privacy — much to the regret of President Clinton. No Person except a natural born Citizen, or a Citizen of the United States, at the time of the Adoption of this Constitution, shall be eligible to the Office of President . . . . If President Obama was neither born in one of the states nor abroad to parents in the service of the United States (as was Senator McCain), he simply is not constitutionally qualified to be the president. The Constitution is rather an important document but is too often ignored. The practical and legal problems revolve around the fact that he was elected to the office, sworn in as president, and in the intervening more than six months has signed into law several major pieces of legislation. There are few possible legal ways to force him to cease functioning as the president, and none of them seem likely to work. Even if he were to announce tomorrow that he was born in Kenya, that he had accepted in good faith the fiction that he had been born in Hawaii and has only recently learned the shocking truth that he is not constitutionally qualified but that he will nevertheless not resign voluntarily because the people elected him and trust him and need his wise leadership, so what? I do not know where President Obama was born, and the persistent refusal to release his long form birth certificate combined with the equally persistent refusal to release a long list of other stuff is puzzling and disturbing. I agree that “we’ve gone too far in demanding that politicians reveal every detail of their personal lives.” I also think that using their sweet little children as campaign props is unfortunate. However, I do not consider President Obama’s constitutional qualification or lack thereof to be in the “every detail” of his “personal” life category, no matter how broadly it may be interpreted. What to do about it? The only thing that occurs to me is for the states to require adequate proof — well beyond a mere affirmation based on personal belief — of constitutional qualification as a requirement to be on their ballots and to do so sufficiently in advance of the next presidential election to make a difference and to avoid such questions in the future. To the extent that the “birther” stuff may cause legislation doing that it has been a worthwhile exercise. Dan, as you know, some states are enacting laws that would require presidential candidates to prove their eligibility for the office before they could be on the state’s ballot. I think that’s fine; it’s a serious question, and there’s no reason states shouldn’t require proof that a candidate is eligible. I would point out, however, that Obama’s Certificate of Live Birth from Hawaii is legally adequate for that purpose. If a state declined to accept that document, I expect they would lose a court challenge. As to conspiracy theorists, they don’t necessarily have to believe that there are aliens living among us. I think the evidence that Obama was born in Hawaii is more than sufficient, and to continue insisting that he wasn’t (or might not have been) rises to the level of conspiracy theory. The same is true of the “truthers” who continue to insist that the government was in some way complicit in 9/11. All this stuff is aggressive ignorance on the part of people who have an agenda and lack ammunition. All that brings me back to the basic question: Why doesn’t Obama put the issue to rest by authorizing the release of his birth records? Aside from the Machiavellian possibility, I can imagine why he wouldn’t. Last point: If it emerged that President Obama is not eligible to be president, I think you’re right that it would be just about impossible to force him from the office if he didn’t want to go. I suppose impeachment would be a possibility, but I don’t know if this would meet the “high crimes and misdemeanors” requirement, especially if he didn’t know the truth to begin with (as you postulated). Of course, “high crimes and misdemeanors” means what the House thinks it means on any given day and nothing more or less. But I’m not sure that enough votes could be found in the House to impeach, and I’m virtually certain that the Senate wouldn’t convict. Frankly, that kind of constitutional crisis is the last thing we need right now, and I hope it never happens. Sally Jones, the unemployed civilian U.S. citizen wife of Captain Jones, a U.S citizen stationed on an accompanied Eighth Army tour with the U.S. Army in Korea, gives birth to little William Jones at a military hospital there. However, Captain Jones was sterile and William was conceived through the marvels of modern technology courtesy of a sperm donor. The identity and citizenship of William’s biological father are unknown. Ditto, but substitute Captains Sally Jones and Susan Smith, a married lesbian couple. Ditto, but substitute Sergeant Juan Gomez, a Mexican citizen — U.S. Army NCO married to Kim Choe, a Korean national. Further assume either traditional conception or the intervention of an anonymous sperm donor. Assume traditional conception resulting in the birth of little Bertrand Smythe-Jones to the wife of the chargé d’affaires at the British Embassy in Washington, D.C. The birth takes place at a hospital in Washington subject to U.S. jurisdiction and not within the confines of the embassy compound. Assume that the daughter of two Mexican nationals is born in El Paso, Texas. Personally or through the intervention of her parents upon returning with her to Mexico she thereafter renounces her U.S. citizenship but at the age of thirty becomes a naturalized U.S. citizen. Assume that Bill Johnson and his wife, Mary, both U.S. citizens, produce a little boy in their native state of Nebraska. He is clearly a “natural born” U.S. citizen. Bill Junior at the age of eighteen joins the army of North Korea and forfeits his U.S. citizenship. He thereafter returns to the U.S. and becomes a naturalized U.S. citizen. It does get a tad complex and I don’t know what the results might be should one of the U.S. citizen offspring aspire to the U.S. presidency; a “natural born” U.S. citizen? I have done no recent research, but am not aware of any adjudication of the constitutional questions by the Supreme Court. I doubt that historical (or even hysterical) analysis would provide many answers. I do not want to imagine what would happen in this country if it was revealed that Obama took the oath of the presidency under false pretenses. As for future presidents, I am more concerned that they have proven senior executive leadership experience requisite of the office. I am tired of legislative action officers and scholars who have no street smarts running the country. Geez, Dan, you’re giving me a headache! I’m with you, Lisa. Only the most out-of-touch right-wingers would welcome the prospect of Obama turning out to be ineligible for the presidency. It would tear the country apart. As for future presidents, I couldn’t agree more. The biggest problem with Obama is not his ideology; he’s proven that he can adjust to political realities when he has to. The problem is he’s just not up to the job. I hope we’re smart enough next time to elect a president — Democrat or Republican — with some serious executive management experience. That means, practically speaking, having been a successful governor, a very senior military officer, or a successful high-level business executive, or better yet some combination of all three. Be of good cheer and have no concern! Headaches are a form of penance, to prepare for the Day of Rapture. It will come on May 21 of this, the last year; the world will end on October 22. This, according to the most e-mailed story from Yahoo today. There is, therefore, no need to worry about President Obama’s place of birth or anything else. My only unhappiness is that President Obama will not find time in his busy schedule to increase engagement with Africa; to that end, he tried unsuccessfully while mercilessly burdened with other matters of state during his brief and modest vacation in Hawaii to contact incumbent President Laurent Gbagbo of the Ivory Coast by telephone. Failing that, he wrote a letter “offering him an international role if he stopped clinging to power and stepped down.” May the Farce Force be with him; or something.